Above: Larry Hogan Jr. makes a victory speech just after midnight early Wednesday. CORRECTION 11/5/2014, 1 p.m.: The original gains for Republicans in the House were based on earlier, incomplete returns. At this time, there are now likely 7 additional GOP delegates for a total of 50. Maryland Republicans made historic gains in Tuesday’s election. Larry Hogan Jr. became just the third Republican elected governor in the past 50 years, winning by almost the same 51.5% margin and carrying almost the same number of counties as Gov. Bob Ehrlich, the last Republican chief executive 12 years ago. Sen. Allan Kittleman became just the second Republican Howard County executive in its history, and Del. Steve Schuh, as expected, kept the Anne Arundel County executive office in GOP hands. On the Lower Shore, Bob Culver defeated Democrat Richard Pollitt, the first Wicomico County executive. Ex-Secret Service agent Dan Bongino came very close to unseating freshman Democratic Congressman John Delaney in the 6th Congressional District, redrawn to put it into Democratic hands. Delaney, a wealthy former banker, had to put up $800,000 of his own money in the closing weeks to hold onto his seat. But it was in the Maryland General Assembly that the GOP matched Hogan’s unanticipated victory with unexpected gains — despite partisan gerrymandering by Democrats that sought to cut the GOP’s numbers. Republicans picked up seven seats in the House of Delegates and two in the state Senate. The GOP will have 50 seats in the 141-seat House, when just months ago their leaders thought they would be lucky to hold onto the 43 seats they currently have, already a historic high number for Republicans in the Maryland House. There will now be 24 Republican delegates returning and 26 new GOP delegates, according to House Minority Whip Kathy Szeliga. Hundreds of Republicans gathered for the Hogan victory party at the Annapolis Westin Hotel. Singing and dancing with a live band, hugging and high-fiving, few were as elated as Ellen Sauerbrey, the former House of Delegates minority leader who was almost elected governor in 1994, losing to Parris Glendening by 6,007 votes. Many in the GOP feel she actually won that election if it were not for Democratic vote tampering. Clearly, they had had it in Dundalk. In one of their most remarkable wins, Republicans swept the Senate seat and three House seats in District 6, the Dundalk-Essex area that had always elected Democrats. They also knocked off the longtime chair of the House Appropriations Committee, Norman Conway, on the Lower Shore, and an appropriations subcommittee chair, John Bohanan, in the increasingly Republican St. Mary’s County. In St. Mary’s, Republican Steve Waugh also ended the 36-year political career of state Sen. Roy Dyson, an education and health committee vice chair who had served 10 years in Congress before he was elected to the state Senate. The GOP also held onto the Harford-Cecil Senate seat held by Sen. Nancy Jacobs, with Bob Cassilly defeating Mary-Dulany James, another House Appropriations subcommittee chair. For more detailed coverage of the legislative races, see a separate story. Sauerbrey said Hogan won with a strong disciplined message that focused on taxes, spending and jobs. Hogan kept to that message Tuesday night in his victory speech. Christie, chair of the Republican Governor’s Association, made four visits to the state and funnelled money for ads to boost the underfunded Hogan campaign, which had accepted public funding that limited fundraising. “Tonight we have sent a loud and clear message to Annapolis,” Hogan said. Hogan emphasized his willingness to work in a bipartisan way, as he did through his organization Change Maryland, which became the theme and basis of his campaign. Wednesday he is scheduled to hold a press conference to announce his transition team. After his speech, Hogan spent almost an hour greeting and talking to people left in the Westin ballroom. But one of the sure signs of his new status as governor-elect were the plainclothes state troopers of the executive protection detail who became visible as Hogan took the stage. Afterward, at least six hovered near Hogan as he worked the crowd, two were with Lt. Gov.-elect Boyd Rutherford, and one scanned the room near Hogan’s wife, Yumi, a Korean American artist. One of the executive protection detail’s black Chevy Tahoe hybrid SUVs waited to transport Hogan outside the Westin, not far from the Hogan-Rutherford bus that he had been traveling in for months. 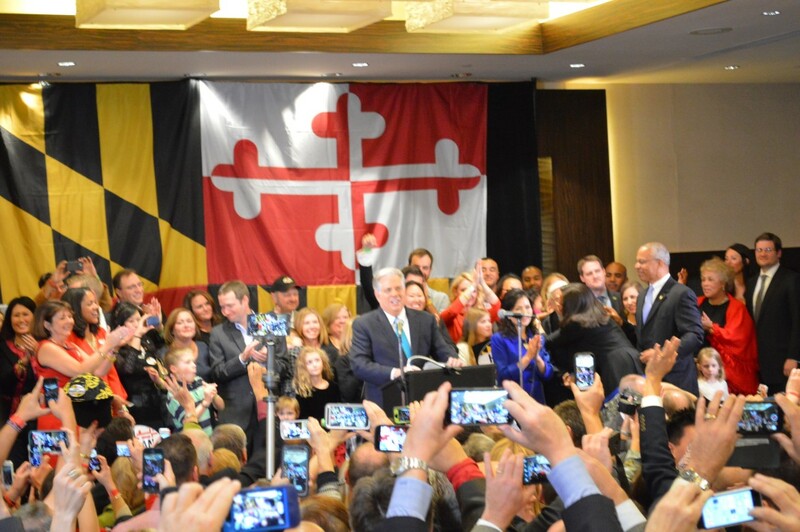 Many of the newly elected legislators and officeholders traveled to Annapolis to join Hogan in the early morning after their own victory celebrations, relishing the prospect working with a friend in the State House as they took on their new posts. “It can’t get more exciting than this,” said Del. Susan Krebs, elected to her fourth term from Carroll County. One of the more meaningful endorsements in the Republican campaign for governor got lost in the shuffle last week. Former House of Delegates Minority Leader Ellen Sauerbrey, almost elected governor in 1994, and her then-archrival, former U.S. Rep. Helen Delich Bentley, along with former Baltimore County Executive Roger Hayden, enthusiastically endorsed Harford County Executive David Craig for governor and his running mate Del. Jeannie Haddaway on Wednesday.